Clean, wash and dry the lettuce leaves. Tear into small pieces. Wash the tomatoes, remove the core and cut into eight. Peel the onion and cut into strips. Place two walnuts to one side for decoration and chop the remainder into small pieces. Cut the CAMBOZOLA into bite sized pieces and set a few pieces aside for decoration. Puree the orange juice with the yoghurt, vinegar, sugar and remaining CAMBOZOLA pieces with a hand mixer for the dressing and season with salt and pepper. Mix the salad ingredients together in a bowl and mix well with dressing. 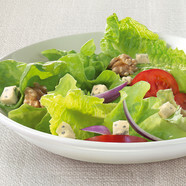 Arrange the salad on deep plates and sprinkle with the reserved walnuts and CAMBOZOLA cubes. This dressing also goes very well with a pasta salad with peas, carrots and kohlrabi.